Escalators are used around the world to move pedestrian traffic in places where elevators would be impractical. Principal areas of usage include department stores, shopping malls, airports, transit systems, convention centers, hotels, arenas, stadiums, train stations (subways) and public buildings. Escalators have the capacity to move large numbers of people, and they can be placed in the same physical space as a staircase. They have no waiting interval (except during very heavy traffic), they can be used to guide people toward main exits or special exhibits, and they may be weatherproofed for outdoor use. A non-functioning escalator can function as a normal staircase, whereas many other conveyances become useless when they break down. Escalators, like moving walkways, are often powered by constant-speed alternating current motors and move at approximately 1–2 feet (0.3–0.6 m) per second. The typical angle of inclination of an escalator to the horizontal floor level is 30 degrees with a standard rise[clarification needed] up to about 60 feet (18 m). Modern escalators have single-piece aluminum or stainless steel steps that move on a system of tracks in a continuous loop. Escalators have three typical configuration options: parallel (up and down escalators side by side or separated by a distance, seen often in metro stations and multilevel motion picture theaters), crisscross (minimizes space requirements by "stacking" escalators that go in one direction, frequently used in department stores or shopping centers), and multiple parallel (two or more escalators together that travel in one direction next to one or two escalators in the same bank that travel in the other direction). As a safety measure, escalators are required to have moving handrails that keep pace with the movement of the steps. This helps riders steady themselves, especially when stepping onto the moving stairs. Occasionally, a Handrail will move at a slightly different speed from the steps, causing it to "creep" slowly forward or backward relative to the steps. The loss of synchronization between handrail and step speed can result from slippage and wear. The direction of escalator movement (up or down) can be permanently set, or be controlled by personnel according to the predominant flow of the crowd, or be controlled automatically. In some setups, direction is controlled automatically by whoever arrives first, whether at the bottom or at the top (the system is programmed so that the direction is not reversed while a passenger is on the escalator). A number of factors affect escalator design, including physical requirements, location, traffic patterns, safety considerations, and aesthetic preferences. Foremost, physical factors like the vertical and horizontal distance to be spanned must be considered. These factors will determine the length and pitch of the escalator. The building infrastructure must be able to support the heavy components. The escalator should be located where it can be easily seen by the general public. In department stores, customers should be able to view the merchandise easily. Furthermore, up and down escalator traffic should be physically separated and should not lead into confined spaces. Traffic patterns must also be anticipated. In some buildings, the objective is simply to move people from one floor to another, but in Others there may be a more specific requirement, such as funneling visitors towards a main exit or exhibit. The escalators must be designed to carry the required number of passengers. For example, a single-width escalator traveling at about 1.5 feet (0.5 m) per second can move about 2000 people per hour. The carrying capacity of an escalator system must match the expected peak traffic demand, presuming that passengers ride single file. This is crucial if there are sudden increases in the number of riders. For example, escalators at stations must be designed to cater for the peak traffic flow discharged from a train, without causing excessive bunching at the escalator entrance. In this regard, escalators help in controlling the flow of people. For example, an escalator to an exit effectively discourages most people from using it as an entrance[clarification needed], and may reduce security concerns. Similarly, escalators often are used as the exit from airport security checkpoints. Such an egress point would still generally be staffed to prevent its use as an entrance during times of light pedestrian traffic. It is preferred that staircases be located adjacent to the escalator if the escalator is the primary means of transport between floors. It may also be necessary to provide an elevator lift near the escalator for wheelchairs and disabled people. Finally, consideration should be given to the aesthetics of the escalator. These two platforms house the curved sections of the tracks, as well as the gears and motors that drive the stairs. The top platform contains the motor assembly and the main drive gear, while the bottom holds the step return idler sprockets. These sections also anchor the ends of the escalator truss. In addition, the platforms contain a floor plate and a combplate. The floor plate provides a place for the passengers to stand before they step onto the moving stairs. This plate is flush with the finished floor and is either hinged or removable to allow easy access to the machinery below. The combplate is the piece between the stationary floor plate and the moving step. It is so named because its edge has a series of cleats that resemble the teeth of a comb. These teeth mesh with matching cleats on the edges of the steps. This design is necessary to minimize the gap between the stair and the landing, which helps prevent objects from getting caught in the gap. The track system is built into the truss to guide the step chain, which continuously pulls the steps from the bottom platform and back to the top in an endless loop. There are actually two tracks: one for the front wheels of the steps (called the step-wheel track) and one for the back wheels of the steps (called the trailer-wheel track). The relative positions of these tracks cause the steps to form a staircase as they move out from under the combplate. Along the straight section of the truss the tracks are at their maximum distance apart. This configuration forces the back of one step to be at a 90-degree angle relative to the step behind it. This right angle bends the steps into a shape resembling a staircase. At the top and bottom of the escalator, the two tracks converge so that the front and back wheels of the steps are almost in a straight line. This causes the stairs to lay in a flat sheetlike arrangement, one after another, so they can easily travel around the bend in the curved section of track. The tracks carry the steps down along the underside of the truss until they reach the bottom landing, where they pass through another curved section of track before exiting the bottom landing. At this point the tracks separate and the steps once again assume a staircase configuration. This cycle is repeated continually as the steps are pulled from bottom to top and back to the bottom again. The steps themselves are solid, one piece, die-cast aluminum or steel. Yellow demarcation lines may be added to clearly indicate their edges. In most escalator models manufactured after 1950, both the riser and the tread of each step is cleated (given a ribbed appearance) with comblike protrusions that mesh with the combplates on the top and bottom platforms and the succeeding steps in the chain. Seeberger- or "step-type" escalators (see below) featured flat treads and smooth risers; other escalator models have cleated treads and smooth risers. The steps are linked by a continuous metal chain that forms a closed loop. The front and back edges of the steps are each connected to two wheels. The rear wheels are set further apart to fit into the back track and the front wheels have shorter axles to fit into the narrower front track. As described above, the position of the tracks controls the orientation of the steps. The handrail provides a convenient handhold for passengers while they are riding the escalator. In an escalator, the handrail is pulled along its track by a chain that is connected to the main drive gear by a series of pulleys. It is constructed of four distinct sections. At the center of the handrail is a "slider", also known as a "glider ply", which is a layer of a cotton or synthetic textile. The purpose of the slider layer is to allow the handrail to move smoothly along its track. The next layer, known as the "tension member", consists of either steel Cable or flat steel tape, and provides the handrail with tensile strength and flexibility. On top of tension member are the inner construction components, which are made of chemically treated rubber designed to prevent the layers from separating. Finally, the outer layer-the only part that passengers actually see-is the cover, which is a blend of synthetic polymers and rubber. This cover is designed to resist degradation from environmental conditions, mechanical wear and tear, and human vandalism. In the factory, handrails are constructed by feeding rubber through a computer-controlled extrusion machine to produce layers of the required size and type in order to match specific orders. The component layers of fabric, rubber, and steel are shaped by skilled workers before being fed into the presses, where they are fused together. In the mid-twentieth century, some handrail designs consisted of a rubber bellows, with rings of smooth metal cladding called "bracelets" placed between each coil. This gave the handrail a rigid yet flexible feel. Additionally, each bellows section was no more than a few feet long, so if part of the handrail was damaged, only the bad segment needed to be replaced. These forms of handrail have largely been replaced with conventional fabric-and-rubber railings. A "freestanding" escalator reveals its inner components through the transparent truss. Escalators have a grip at their side for passengers aboard to hold. Safety is a major concern in escalator design. In India, where women wear saris, there are heavy chances of getting the pallu entangled in the escalator. As a result, a special sari guard is built into most escalators. There is a risk of foot injuries for children wearing footwear such as Crocs and flip-flops that might get caught in escalator mechanisms. This was due to the softness of the shoe's material combined with the smaller size of children's feet. Fire protection of an escalator may be provided by adding automatic fire detection and suppression systems inside the dust collection and engineer pit, in addition to any water sprinkler system installed in the ceiling. To limit the danger caused by overheating, ventilation for the spaces that contain the motors and gears must be provided, and small targeted clean agent automatic extinguishing systems can be installed in these areas. Fire protection of an escalator floor opening may be provided by adding automatic sprinklers or fireproof shutters to the opening, or by installing the escalator in an enclosed fire-protected hall. Crisscross layout of escalator at Mahboonkrong Center, widely known as the MBK Center, in Bangkok. Such layouts are used to minimize structural space requirements by "stacking" escalators that go in one direction. The King's Cross fire of 1987 illustrated the demanding nature of escalator upkeep and the devices` propensity to collect [fluff" when not properly maintained. In the official inquiry that followed, the Fennell Report, it was determined that the fire started slowly, smouldered virtually undetected for a time, then exploded into the ticket hall above in a previously-unrecognised phenomenon known as the [trench effect." In the escalators` undercarriage, approximately 8,800 kilograms (19,400 lb) of accumulated detritus acted as a wick to a neglected buildup of interior lubricants; wood veneers, paper and plastic advertisements, solvent-based paint, plywood in the ticket hall, and melamine combustion added to the impact of the calamity. As a result of the report, older wooden escalators were removed from service in the London Underground. Additionally, sections of the London Underground that were actually below ground were made nonsmoking; eventually the whole system became a smoke-free zone. In the 1930s, at least one suit was filed against a department store, alleging that its escalators posed an attractive nuisance, responsible for a child`s injury. Despite their considerable scope, two Congressional Acts (the Rehabilitation Act of 1973 and the Americans with Disabilities Act of 1990 (ADA)) did not directly affect escalators or their public installations. Since Section 504 of the Rehabilitation Act included public transportation systems, for a few years, the United States Department of Transportation considered designs to retrofit existing escalators for wheelchair access. Nonetheless, Foster-Miller Associates' 1980 plan, Escalator Modification for the Handicapped was ultimately ignored in favor of increased elevator installations in subway systems. Likewise, the ADA provided more accessibility options, but expressly excluded escalators as "accessible means of egress," advocating neither their removal nor their retention in public structures. In the United States and Canada, new escalators must abide by ASME A17.1 standards, and old/historic escalators must conform to the safety guidelines of ASME A17.3. In Europe, the escalator safety code is EN115. Nathan Ames, a patent solicitor from Saugus, Massachusetts, is credited with patenting the first "escalator" in 1859, despite the fact that no working model of his design was ever built. His invention, the "revolving stairs", is largely speculative and the patent specifications indicate that he had no preference for materials or potential use (he noted that steps could be upholstered or made of wood, and suggested that the units might benefit the infirm within a household use), though the mechanization was suggested to run either by manual or hydraulic power. In 1889, Leamon Souder successfully patented the "stairway", an escalator-type device that featured a "series of steps and links jointed to each other". No model was ever built. This was the first of at least four escalator-style patents issued to Souder, including two for spiral designs (U. S. Patent Nos. 723,325 and 792,623). On March 15, 1892, Jesse W. Reno patented the "Endless Conveyor or Elevator." A few months after Reno's patent was approved, George A. Wheeler patented his ideas for a more recognizable moving staircase, though it was never built. Wheeler`s patents were bought by Charles Seeberger; some features of Wheeler`s designs were incorporated in Seeberger`s prototype built by the OTIS Elevator Company in 1899. Reno, a graduate of Lehigh University, produced the first working escalator (he actually called it the "inclined elevator") and installed it alongside the Old Iron Pier at Coney Island, New York City in 1896. This particular device was little more than an inclined belt with cast-iron slats or cleats on the surface for traction, and traveled along a 25° incline. A few months later, the same prototype was used for a month-long trial period on the Manhattan side of the Brooklyn Bridge. Reno eventually joined forces with Otis, and retired once his patents were purchased outright. Some Reno-type escalators were still being used in the Boston subway until construction for the Big Dig precipitated their removal. The Smithsonian Institution considered re-assembling one of these historic units from 1914 in their collection of Americana, but "logistics and reassembly costs won out over nostalgia", and the project was discarded. Around May 1895, Charles Seeberger began drawings on a form of escalator similar to those patented by Wheeler in 1892. This device actually consisted of flat, moving stairs, not unlike the escalators of today, except for one important detail: the step surface was smooth, with no comb effect to safely guide the rider's feet off at the ends. Instead, the passenger had to step off sideways. To facilitate this, at the top or bottom of the escalator the steps continued moving horizontally beyond the end of the handrail (like a miniature moving sidewalk) until they disappeared under a triangular "divider" which guided the passenger to either side. Seeberger teamed with Otis in 1899, and together they produced the first commercial escalator which won the first prize at the Paris 1900 Exposition Universelle in France. Also on display at the Exposition were Reno's inclined elevator, a similar model by James M. Dodge and the Link Belt Machinery Co., and two different devices by French manufacturers Hallé and Piat. Piat installed its "stepless" escalator in Harrods Knightsbridge store on Wednesday, November 16, 1898, though the company relinquished its patent rights to the department store. Noted by Bill Lancaster in The Department Store: a Social History, "customers unnerved by the experience were revived by shopmen dispensing free smelling salts and cognac." The Harrods unit was a continuous leather belt made of "224 pieces . . . strongly linked together traveling in an upward direction," and was the first "moving staircase" in England. Hocquardt received European patent rights for the Fahrtreppe in 1906. After the Exposition, Hallé continued to sell its escalator device in Europe, but was eventually eclipsed in sales by other major manufacturers. In the first half of the twentieth century, several manufacturers developed their own escalator products, though they had to market their devices under different names, due to Otis` hold on the trademark rights to the word [escalator." New York-based Peelle Company called their models the Motorstair, and Westinghouse called their model an Electric Stairway. The Toledo-based Haughton Elevator company referred to their product as simply Moving Stairs. KONE and SCHINDLER introduced their first escalator models several decades after the Otis Elevator Co., but grew to dominance in the field over time. Today, they, MITSUBISHI, and ThyssenKrupp are Otis' primary rivals. Schindler now stands as the largest maker of escalators and second largest maker of elevators in the world, though their first escalator installation did not occur until 1936. In 1979, the company entered the United States market by purchasing Haughton Elevator; nine years later, Schindler assumed control of the North American escalator/elevator operations of Westinghouse. Kone expanded internationally by acquisition in the 1970s, buying out Swedish elevator manufacturer Asea-Graham, and purchasing other minor French, German, and Austrian elevator makers before assuming control of Westinghouse`s European elevator business. As the last "big four" manufacturers held on to the escalator market, KONE first acquired Montgomery Elevator Company, then took control of Germany`s Orenstein & Koppel Rolltreppen. Jesse Reno, in addition to being known for the first practical escalator in public use, also designed the first escalators installed in any underground subway system in the form of a spiral (actually a helical) escalator at Holloway Road tube station in London in 1906. The experimental device never saw public use, and was forgotten for several decades. The remains of this are now in the London Transport Museum's depot in Acton. Also the first fully operational spiral escalator, Reno`s design was nonetheless only one in a series of several similar proposed contraptions. Souder patented two helical designs (see above), Wheeler drafted helical stairway plans in 1905, Seeberger devised at least two different helical units between 1906 and 1911 (including an unrealized arrangement for the London Underground), and Gilbert Luna obtained West German, Japanese, and United States patents for his version of a spiral escalator by 1973. When interviewed for the Los Angeles Times that year, Luna was in the process of soliciting major firms for acquisition of his patents and company, but statistics are unclear on the outcome of his endeavors in that regard. 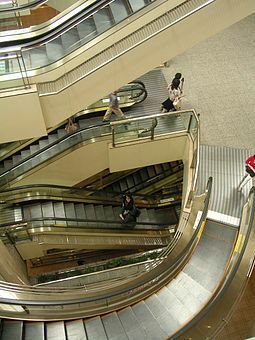 The Mitsubishi Electric Corporation was most successful in its development of spiral/helical escalators, and has sold them exclusively since the mid-1980s. The world's first practical spiral escalator-a Mitsubishi model-was installed in Osaka, Japan, in 1985. Helixator, an experimental spiral/helical escalator design which currently exists as a prototype scale model, could further reduce the floor space. The design has several innovations that offer the possibility of a continuous helix. Driven by a linear motor instead of a chain system, the Helixator spreads the force evenly along the escalator path, avoiding excessive force on the top chain links and removing geometry, length and height limits. Levytator, a design originating at City University in London, can move in straight lines or curves with or without rising or descending. The returning steps do not move uselessly underneath the in-use steps: rather, they provide active steps for travel in the opposite direction. Several authors and historians have contributed their own differing interpretations of the source of the word [escalator", and some degree of misinformation has heretofore proliferated on the Internet. For reference, contradictory citations by seven separate individuals, including the Otis Elevator Company itself, are provided below. Charles Seeberger created the word "escalator" in 1900, to coincide with his device`s debut at the Exposition Universelle. According to his own account, in 1895, his legal counsel advised him to name his new invention, and he then set out to devise a title for it on his own. As evidenced in Seeberger's own handwritten documents, archived at the Otis Elevator Company headquarters in Farmington, Connecticut, the inventor consulted "a Latin lexicon" and "adopted as the root of the new word, 'Scala'; as a prefix, 'E' and as a suffix, 'Tor.'" His own rough translation of the word thus created was "means of traversing from", and he intended for the word to be pronounced, "es‧ʹkæl‧ə‧tər" (es-CAL-a-tor). "Escalator" was not a combination of other French or Greek words, and was never a derivative of "elevator" in the original sense, which means "one who raises up, a deliverer" in Latin. Similarly, the root word "scala" does not mean "a flight of steps", but is defined by Lewis and Short`s A Latin Dictionary as the singular form of the plural noun "scalae", which denotes any of the following: "a flight of steps or stairs, a staircase; a ladder, [or] a scaling-ladder." The alleged intended capitalization of "escalator" is likewise a topic of debate. Seeberger`s trademark application lists the word not only with the "E" but also with all of the letters capitalized (in two different instances), and he specifies that, "any other form and character of type may be employed . . . without altering in any essential manner the character of [the] trade-mark." That his initial specifications are ostensibly inconsistent, and since Otis Elevator Co. advertisements so frequently capitalized all of the letters in the word, suppositions about the "capital `e`" are difficult to formulate. The verb "escalate" originated in 1922, and has two uses, the primary: "to climb or reach by means of an escalator" or "to travel on an escalator", and the secondary: "to increase or develop by successive stages; spec. to develop from 'conventional' warfare into nuclear warfare." The latter definition was first printed in the Manchester Guardian in 1959, but grew to prominent use during the late 1960s and early 1970s. In 1950, the landmark case Haughton Elevator Co. v. Seeberger precipitated the end of Otis's reign over exclusive use of the word "escalator", and simultaneously created a cautionary study for companies and individuals interested in trademark retention. Confirming the contention of the Examiner of Trademark Interferences, Assistant Commissioner of Patents Murphy`s decision rejected the Otis Elevator Company`s appeal to keep their trademark intact, and noted that "the term 'escalator' is recognized by the general public as the name for a moving stairway and not the source thereof", observing that the Otis Elevator Co. had "used the term as a generic descriptive term-in a number of patents which [had] been issued to them and-in their advertising matter." All trademark protections were removed from the word "escalator", the term was officially genericized, and it fell into the public domain. As noted above, a few escalator types were installed in major department stores (including Harrods) before the Expo. Escalators proved instrumental in the layout and design of shopping venues in the twentieth century. By 1898, the first of Reno`s "inclined elevators" were incorporated into the Bloomingdale Bros. store at Third Avenue and 59th Street. This was the first retail application of the devices in the US, and no small coincidence, considering that Reno's primary financier was Lyman Bloomingdale, co-owner of the department store with brother Joseph Bloomingdale. The first "standard" escalator installed on the London Underground was a Seeberger model at Earls Court. Noted above, London's Underground installed a rare spiral escalator designed by Reno, William Henry Aston and Scott Kietzman for the Holloway Road Underground station in 1906; it was run for a short time but was taken out of service the same day it debuted. The older lines of the London Underground had many escalators with wooden treads (ca. 1930s) until they were rapidly replaced following the King's Cross fire, noted above. In 1905, the American Woolen Company`s Wood Mill in Lawrence, Massachusetts (then "the largest single worsted mill in the world") utilized Otis' Seeberger-type "reversible" escalators to carry its workers between floors four times a day. The machines did not run all day: rather, escalators ran solely to transport employees to/from midday meals and in/out of the mill. In its advertising, Otis Elevator Company hailed this unconventional use for its unique benefits to both workers and owners: "The profitable and practicable feature of the Escalator, from the viewpoint of the owner, is the increased efficiency of each operator due to the elimination of stair climbing." In San Francisco, an escalator at Hunters Point Naval Shipyard was used to convey personnel between the first and third floors. At the time of its construction in 1948, it was touted thus: "[it has the] highest lift of any industrial building in the world. It rises 42 feet (12.8 meters)." Escalators were also utilized on aircraft carriers such as the USS Hornet (CV-12), to transport pilots from "ready rooms" to the flight deck. Macy's Herald Square store in New York City holds some well-known historic escalators. The model shown here, retrofitted with metal steps in the 1990s, is among the oldest of the store's 40 escalators. Otis "L-type" escalators with distinctive wood treads (not shown) have operated in the store since 1927. St. Anna Pedestrian Tunnel underneath the Schelde in Antwerp, Belgium. This tunnel was opened in 1933. These escalators, manufactured by Waygood Otis in 1951, were "believed to be the longest single lift escalators in the world", at the time of installation. Presumably the first escalators in Britain designed specifically for cyclists, they were also the longest in the United Kingdom. At most, they may be the longest extant wooden escalators in the world, though they are no longer in working order. Baumanskaya metro station in Moscow, Russia contains the oldest (1944) escalator of tonnel type still in use, with length of 65 m (213 ft) and vertical rise of 32.5 m (107 ft). Central-Mid-Levels escalator: in Hong Kong, tens of thousands of commuters travel each work day between Central, the central business district, and the Mid-levels, a residential district hundreds of feet uphill, using this long distance system of escalators and moving walkways. It is the world's longest outdoor escalator system (not a single escalator span), at a total length of 2,600 feet (790 m). It goes only one way at a time; the direction reverses depending on rush hour traffic direction. In December 2011, a network of six escalators of 1,260 feet (380 m) length, equivalent to 28 stories high, was opened in Medellin, Colombia, offering the 12,000 residents of Comuna 13 a six-minute ride to the city center compared to their previous 35-minute climb on foot. Cascade, Yerevan: an escalator system of 774 ft (236 m) length and 387 ft (118 m) height. Ocean Park, Hong Kong: a long escalator system connecting two parts of the Park, with an overall length of 730 feet (220 m). The longest escalators in the world are installed in deep underground stations of the Saint Petersburg Metro. Three stations have escalators up to 137 m (449 ft) long and 68.5 m (225 ft) high: Ploshchad Lenina, Chernyshevskaya, and Admiralteyskaya. See also Kiev Metro in the Europe section. The longest freestanding (supported only at the ends) escalator in the world is inside CNN Center`s atrium in Atlanta, the United States of America. It rises 8 stories and is 205 feet (62 m) long. Originally built as the entrance to the amusement park The World of Sid and Marty Krofft, the escalator is now used for CNN studio tours. The longest escalator in Bangkok, Thailand and Southeast Asia is in Bangkok Metro's Si Lom Station. It connects the concourse level with platform 1 which in turn connects to Hua Lam Phong. It is 43 m (141 ft) in length and 21.5 m (71 ft) in depth. The Rustaveli station in the Tbilisi Metro has one of the world's longest escalators. It is 60 meters high and 120 meters long. The longest set of single-span uninterrupted escalators in the southern hemisphere is at Parliament underground railway station in Melbourne. In the Park Pobedy station of the Moscow Metro, the escalators are 126.8 m (416 ft) or 740 steps long, and 63.4 m (208 ft) high. It takes three minutes to transit. Three stations in Saint Petersburg Metro have escalators up to 138 m (453 ft) long and 69 m (226 ft) high: Ploshchad Lenina, Chernyshevskaya, and Admiralteyskaya. The longest escalator in Prague, and in European Union, is at the Náměstí Míru station at 285 feet (87 m) long and 142.5 feet (43.4 m) high. The longest escalator of a European shopping mall is at MyZeil, Frankfurt, Germany, with a length of 150 feet (46 m). The tallest escalator on the London Underground system is at Angel station with a length of 200 feet (61 m), and a vertical rise of 90 feet (27 m). The longest escalators in Western Europe are in the Stockholm Metro, at Västra skogen with a length of 220 feet (67 m) and in Helsinki Metro, at Kamppi station with a length of 210 feet (64 m). The largest "single truss escalator" is in the Bentall Centre in Kingston upon Thames in Greater London, UK. It connects the ground floor with the second floor with only top and bottom supports. The longest set of single-span uninterrupted escalators in the Western Hemisphere is at Wheaton station on the Washington Metro Red Line. They are 230 feet (70 m) long with a vertical rise of 115 feet (35 m), and take what is variously described as 2 minutes and 45 seconds or nearly three-and-a-half minutes, to ascend or descend without walking. According to Guinness, the shortest escalator in the world is the "Puchicalator" in the Okadaya Mores shopping mall in Kawasaki, Japan. Its vertical rise is only 32.8 inches (83 cm) and has 5 steps. Westfield San Francisco Centre, San Francisco, California, United States - the first spiral escalator in the Western Hemisphere. In most countries, there is an expectation that escalator users wishing to stand will keep to one side to allow others to overtake them. There is little correspondence between elevator etiquette and which side of the road traffic drives on in a particular country. Germany, Hong Kong, Taiwan, the United Kingdom, and the United States have been cited as countries where riders are expected to stand on the right and walk on the left. However, in Australia and New Zealand, the opposite is the case. Practice may also differ from city to city within countries – in Osaka, the policy is to stand on the right, whereas in Tokyo (and most other Japanese cities), riders are expected to stand on the left. In certain high-traffic systems, including the East Japan Railway Company and the Prague metro, elevator users are encouraged to stand on whichever side they choose, with the aim of preventing wear and tear and asymmetrical burdening.